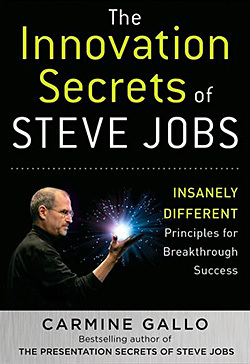 In this excerpt from The Innovation Secrets of Steve Jobs, author Carmine Gallo recounts what Steve Jobs told Nike CEO Mark Parker, and provides a glimpse into Apple’s strategy of focused simplicity. On April 21, 2010, Fast Company magazine sponsored a conference called Innovation Uncensored. Nike president and CEO Mark Parker was one of the featured speakers. Parker told the story of what transpired when, shortly after he became CEO, he got a call from Steve Jobs. “Do you have any advice?” Parker asked Jobs. schools is to reduce risk by diversifying your product offerings. Apple, he said, represents the anti–business school philosophy. Apple’s approach is to put its resources behind a few products and commit to making those products exceptionally well. Certainly the great consumer electronics companies of the past had thousands of products. We tend to focus much more. People think focus means saying yes to the thing you’ve got to focus on. But that’s not what it means at all. It means saying no to the hundred other good ideas that there are. You have to pick carefully. I’m actually as proud of many of the things we haven’t done as the things we have done. The clearest example was when we were pressured for years to do a PDA, and I realized one day that 90% of the people who use a PDA only take information out of it on the road. They don’t put information into it. Pretty soon cell phones are going to do that, so the PDA market’s going to get reduced to a fraction of its current size, and it won’t really be sustainable. So we decided not to get into it. If we had gotten into it, we wouldn’t have had the resources to do the iPod. We probably wouldn’t have seen it coming. Early in Apple’s history, lead investor Mike Markkula sent a memo to Apple’s employees that outlined his marketing strategy. In that memo he talked about the importance of focus. Markkula wrote, “To do a good job of those things that we decide to do, we must eliminate all the unimportant opportunities, select from the remainder only those that we have the resources to do well, and concentrate our efforts on them. Let’s get back to the question asked earlier in the book: can any company innovate the way Apple does? Again, the answer is no. Anyone can learn the principles that drive Apple’s innovation, but innovation takes courage, and few people have it. It takes courage to reduce the number of products a company offers from 350 to 10, as Jobs did in 1998. It takes courage to remove a keyboard from the face of a smartphone and replace those buttons with a giant screen, as Jobs did with the iPhone. It takes courage to eliminate code from an operating system to make it more stable and reliable, as Apple did with Snow Leopard. It takes courage to eliminate all of the words on a PowerPoint slide except one, as Steve Jobs often does in a presentation. It takes courage to feature just one product on the home page of a Web site. It takes courage to launch fewer new products in a year than your competitors launch in a month. It takes courage to adopt unpopular stands, such as saying Adobe flash is unfit for the modern mobile era, as Jobs did in April of 2010. And it takes courage to make a product so simple that a child can use it. Do you have the guts to keep things simple? Steve Jobs does, and it’s been crucial to his success. From The Innovation Secrets of Steve Jobs by Carmine Gallo, reprinted with permission from McGraw-Hill Professional, 2010.